az Ybl Miklós Műszaki Főiskolán. különböző magazinokban (Rakéta Regényújság, Galaktika). 1991-ben állítottam ki először festményeimet. színháznak (Raymond F. Simon-Edmund Kean). 1996-ban három hónapra műtermet béreltem Aachenben. veszek részt itthon és külföldön. 2000-ben Pozsgai Zsolt Fekete Méz c.
He was born in 1964 in Kaposvár. He learned privately from the painters Molnár József and Ruisz György. He moved to Budapest in 1981. He got a degree as an architect at Ybl Miklós Training College. He had illustrated for a couple of years since 1984 in Rakéta Regényújság, ÉS, Galaktika. 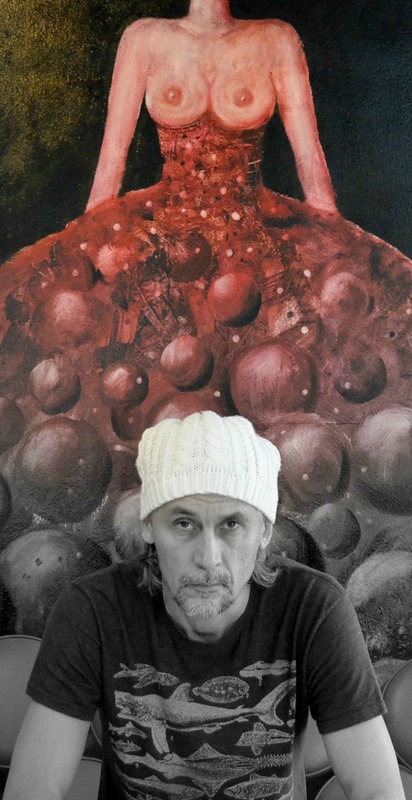 He has exhibited his paintings since 1991. In 1993 Győrfi designed an stage setting to the Theatre of Sopron city for a Raymond F. Simon drama. In 1994 he had worked in the United States for 5 weeks, where he had some exhibition, too. Between 1994 and 1999 he managed the Polaris Galery in Budapest. In 1996 he rented a studio in Aachen and entertained a work there. He participated symposions in Italy, Spain, Austria since 1997. He has begun his applied graphic work at different publishers like Móra, Cicero, Palatinus. In 2000 he made the stage setting of Black Honey (this is a screenplay from Pozsgai Zsolt) in London.